Trancranial Direct Current Stimulation (tDCS) involves applying weak electrical current to the head. Magstim is a distributor of Newronika tDCS equipment. 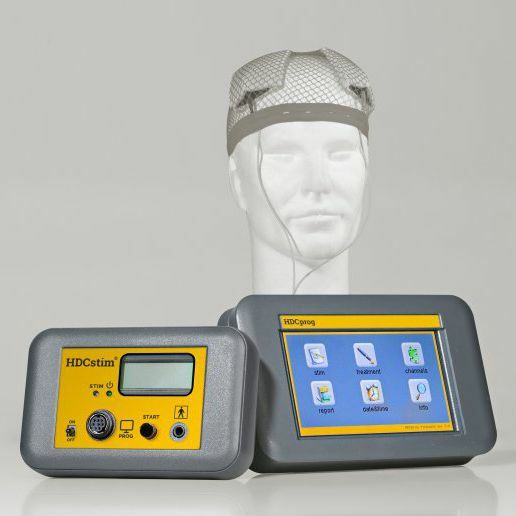 The HDCkit is a modular Transcranial Direct Current Stimulation (tDCS) kit, consisting of a stimulator (HDCstim), a programmer (HDCprog) and a set of electrodes (HDCel). There is also an optional headcap. The modular system enables the patient/subject to use the stimulator which has been pre-programmed by the clinician using the HDCprog. Minimizing the risk of misuse by the patient/subject. One HDCprog can be used to program and oversee multiple HDCstim units. Important: The HDCkit should only be used under the guidance of a trained medical professional. Users of the in the USA please note: CAUTION: Investigational device. Limited by Federal (or United States) Law to investigational use. In accordance with US federal regulations an IDE and/or IRB approval may be required.